The Florida Keys are a great place to have a quintessential experience of coastal subtropical Florida. The skies are typically a deep blue. Clouds are huge, puffy, and, at sunset, tinged with rose, tangerine, and soft blue. Oceans are shallow. Sandy bottoms make for celadon green water, and areas of coral or marine grass provide dark blue or even purple hues. Residents and visitors alike purchase objects reminding them of the area. 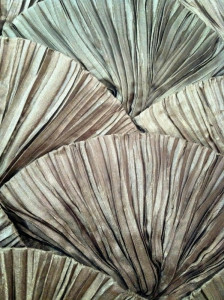 Images abound of shells, dolphin, and coconut palms. On a trip to the Keys I was thinking about the ways that people identify with place. I was reflecting on the extent to which souvenirs serve as touchstones of experience and memory. At one of my stops, I noticed a small pillow. 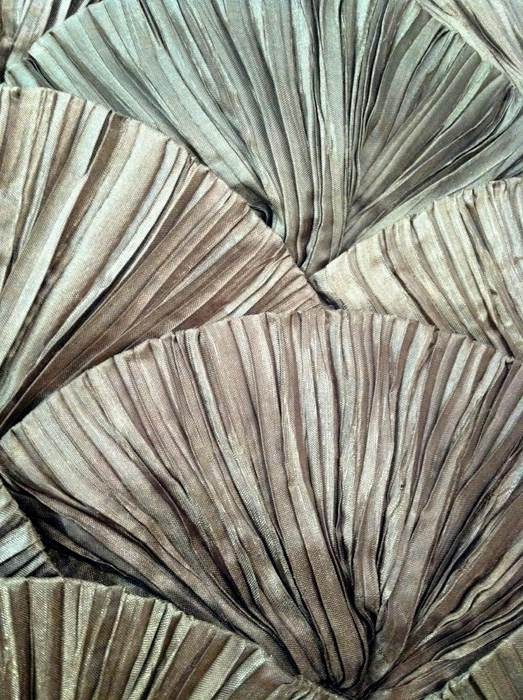 It had a repeating pleated pattern of scallops: shells. Their tones were those of the tropical sea shallows. I immediately wanted to photograph those patterns, textures, and colors. I worked quickly, responding to what my senses were perceiving—and in response to my own feelings, to a lifetime of my own memories of coastal south Florida.